Hi everyone, we are back in town and all caught up from a very successful weekend at Sebring. Redline Time Attack finished off their east coast swing with a stop at the historic Sebring International Raceway, which is one of my favorite tracks. As expected in central Florida ambient temps approached 100F, and 70%+ humidity coupled with 125F track surface temps made for a very tough day for competitors. Based on previous experiences at the track, the general consensus was the track was 3-4 seconds slower than a “typical” day at Sebring while many competitors were unable to complete even one flying lap due to the temps, and the amount of wide open throttle usef on this very long 3.7 mile 17 turn circuit. On Saturday, my objective was to get comfortable with the completely new wheel and tire package we’re running in Modified Class. We switched to 18 inch R888′s in size 305/35/18 up front and 335/30/18 out back mounted on those beautiful HRE C90′s 18X10.5 and 18X12 wheels. With Alex, our crew chief, and Bryan Hise from JRZ waiting in the hot pits, I made 2 complete laps around the circuit and brought the tires up to full competition temp. Sebring’s bumpy surface, and liberal use of concrete tends to make the GT-R push on corner entry. Fortunately, that wasn’t the case even with the wider tire out back. Only in the slowest of right turns, did I feel a bit of understeer, followed by neutral/slight oversteer bias from apex to track out. Although I could live with that, I knew we had to dial most of the understeer out to set the fastest laps around this course. So I dove into the hot pits and we made tire pressure changes up front, and one click softer in the front to help gain some compliance on turn in. The adjustments helped a lot, and were inspiring a lot of confidence. Throughout the day, we got faster and faster, and ended up setting the fastest practice time overall with a 2:18.7. Back in January, I went even faster, with worn out R888′s so it gives you a reference point as to how bad the track conditions were. 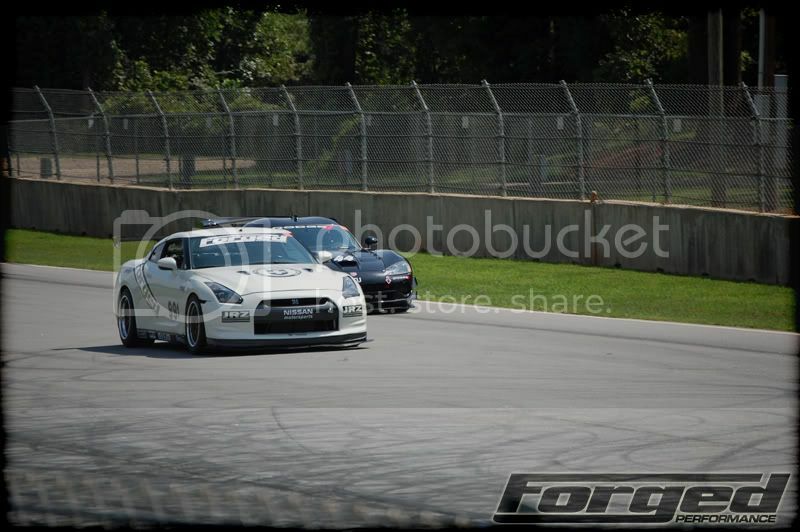 By the end of Sat, things were looking really good for the Forged Performance GT-R, as well as the two other GT-R’s that pitted with us. Catseby Jones, who’s GT-R we prepared for the 2010 One Lap of America race was right behind me, followed by Will Taylor (GoTurnStop/Underpressure). The rest of the field stacked up behind us. Sunday was the big day, where the real competition starts and ends. Two of my biggest competitors, Ryan Gates EvoX, and Turn In Concepts Subaru Imprezza Sti where having major issues with their cars, and we were unsure if they would make the race. Ryan Gates ended up calling it a day, as his car would not cooperate this time, while the guys at TIC completely rebuilt their engine the night before using the concrete paddock is their work space…ouch! We pushed as hard as we could throughout the day, and ending up finishing in 2nd place with a time of 2.17.9. 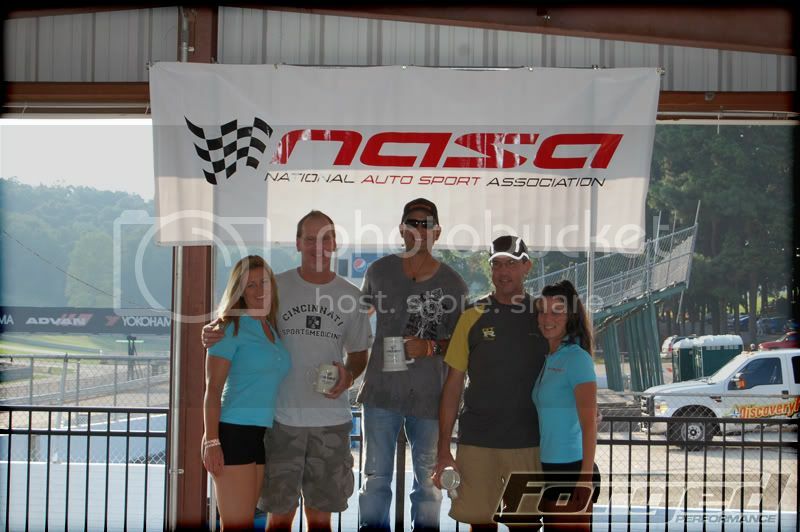 I was very surprised we didn’t beat the TIC car, as I had previously bested him a few weeks back at VIR. This was when I noticed he was running full racing slicks in the class which we all know are prohibited. He was 1.5 seconds faster than me on those tires. The official word from RTA, is that the Continental/Hoosier Grand Am GS Spec racing slick was issued a waiver to compete in the modified class as they feel that the Conti/Hoosier Slick is a slower tire than the NT-01/R888. Although I disagree strongly with this assessment, it’s not my series, and I don’t make the rules or make the waivers. I hold nothing against the guys at TIC, as they were allowed to run the tire, so they did just that. Ok, enough of my crying about the tires. I know we have a faster car on comparable tires, and that’s good enough for me. I wanted to thank all of our sponsors, especially Nissan Motorsports, JRZ (Bryan Hise), HRE Wheels, Cobb Tuning, AMS Performance, and the entire crew at Forged Performance. You won’t meet a more dedicated and passionate group of individuals in this business, and it’s always a pleasure partnering with you all. These guys keep our GT-R running as flawlessly as it runs today and are always available to share technology and R&D. And I wanted to recognize all our friends, clients, and fans for coming out and watching and supporting us through the long hot weekend. You guys are great! As a side note, I also entered the Forged Performance Porsche 996 GT3 in the Super Modified RWD class, and finished in 2nd place with a 2:24, and just a few hundredths of a second away from first! Not bad for a mostly stock car, and stock drivetrain. Thanks, and we look forward to seeing you all on track in the near future! Just wanted to share the news and coverage of the most recent NASA race at Road Atlanta. It was a hot weekend and the cars were fast out there! Sharif managed to pull off a 1:29 in the GT-R with old race tires, and track temps recorded at 115 degrees He got 2 first place finishes in TTU. 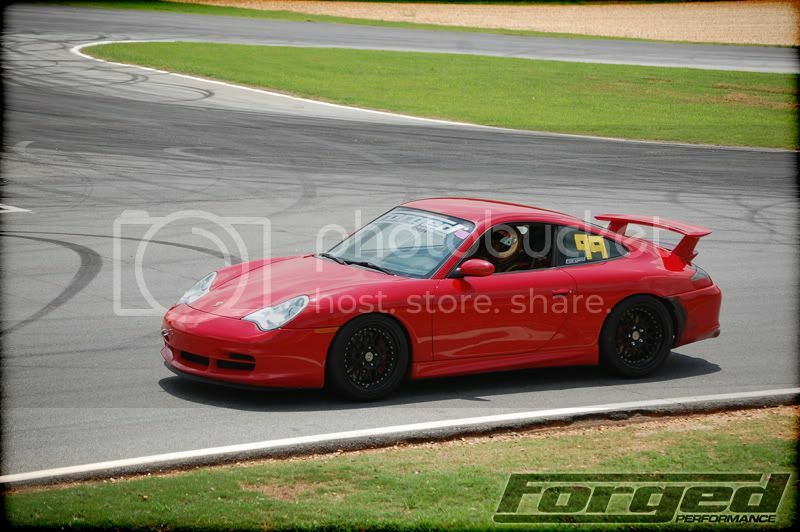 Sharif even had some time out in the Forged Performance GT3 to play around in HPDE. What a weekend! Thank you everybody who came out and showed us support! We also would like to congratulate some of our customers who placed in their class as well. In TTU Class Mark with his GT-R came in 3rd place. In TTS class Khoi came in 1st Place with his Corvette, and Mark won 3rd place in the Viper. Congrats guys!